Again have we the glad tidings of joy, again the announcements of liberty, again the restoration, again the return, again the promise of gladness, again the release from slavery. 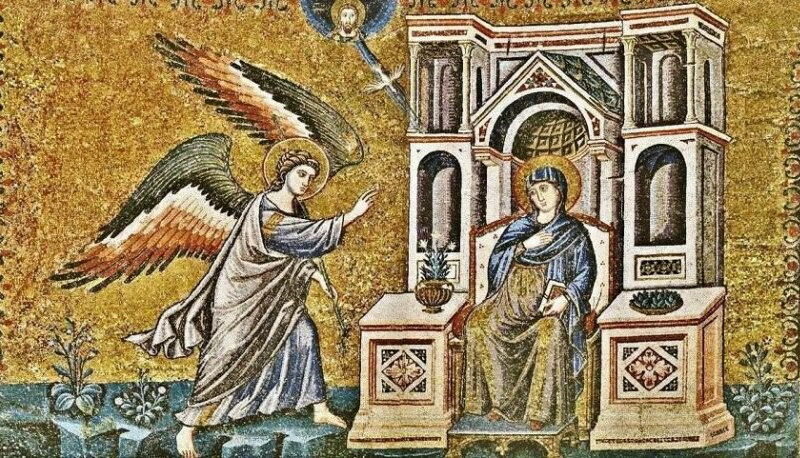 An angel talks with the Virgin, in order that the serpent may no more have converse with the woman. In the sixth month, it is said, the angel Gabriel was sent from God to a virgin espoused to a man. Gabriel was sent to a virgin espoused to Joseph, but preserved for Jesus the Son of God. The incorporeal servant was sent to the virgin undefiled. One free from sin was sent to one that admitted no corruption. The light was sent that should announce the Sun of righteousness. The dawn was sent that should precede the light of the day. Gabriel was sent to proclaim Him who is in the bosom of the Father, and who yet was to be in the arms of the mother. Gabriel was sent to declare Him who is upon the throne, and yet also in the cavern. "In the sixth month Gabriel was sent to a virgin." What is meant by this sixth month? What? It is the sixth month from the time when Elisabeth received the glad tidings, from the time that she conceived John. And how is this made plain? 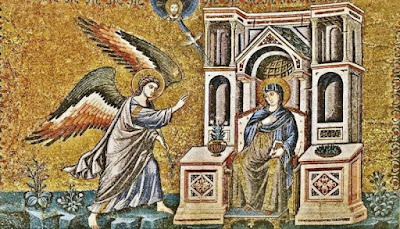 The archangel himself gives us the interpretation, when he says to the virgin: "Behold, your relation Elisabeth, she has also conceived a son in her old age: and this is now the sixth month with her, who was called barren." In the sixth month—that is evidently, therefore, the sixth month of the conception of John. For it was meet that the subaltern should go before; it was meet thai: the attendant should precede; it was meet that the herald of the Lord's coming should prepare the way for Him. In the sixth month the angel Gabriel was sent to a virgin espoused to a man; espoused, not united; espoused, yet kept intact. And for what purpose was she espoused? In order that the spoiler might not learn the mystery prematurely. For that the King was to come by a virgin, was a fact known to the wicked one. For he too heard these words of Isaiah, "Behold, a virgin shall conceive, and bear a son." And on every occasion, consequently, he kept watch upon the virgin's words, in order that, whenever this mystery should be fulfilled, he might prepare her dishonour. Wherefore the Lord came by an I espoused virgin, in order to elude the notice of the wicked one; for one who was espoused was pledged in fine to be her husband's. "In the sixth month the angel Gabriel was sent to a virgin espoused to a man whose name was Joseph." Hear what the prophet says about this man and the virgin: "This book that is sealed shall be delivered to a man that is learned." What is meant by this sealed book, but just the virgin undefiled? From whom is this to be given? From the priests evidently. And to whom? To the artisan Joseph. As, then, the priests espoused Mary to Joseph as to a prudent husband, and committed her to his care in expectation of the time of marriage, and as it behooved him then on obtaining her to keep the virgin untouched, this was announced by the prophet long before, when he said: "This book that is sealed shall be delivered to a man that is learned." And that man will say, I cannot read it. But why can you not read it, O Joseph? I cannot read it, he says, because the book is sealed. For whom, then, is it preserved? It is preserved as a place of sojourn for the Maker of the universe. But let us return to our immediate subject. In the sixth month Gabriel was sent to a virgin — he who received, indeed, such injunctions as these: "Come hither now, archangel, and become the minister of a dread mystery which has been kept hidden, and be the agent in the miracle. I am moved by my compassions to descend to earth in order to recover the lost Adam. Sin has made him decay who was made in my image, and has corrupted the work of my hands, and has obscured the beauty which I formed. The wolf devours my nursling, the home of paradise is desolate, the tree of life is guarded by the flaming sword, the location of enjoyments is closed. My pity is evoked for the object of this enmity, and I desire to seize the enemy. Yet I wish to keep this mystery, which I confide to you alone, still hid from all the powers of heaven. Go, therefore, to the Virgin Mary. Pass on to that animate city whereof the prophet spoke in these words: 'Glorious things were spoken of you, O city of God.' Proceed, then, to my rational paradise; proceed to the gate of the east; proceed to the place of sojourn that is worthy of my word; proceed to that second heaven on earth; proceed to the light cloud, and announce to it the shower of my coming; proceed to the sanctuary prepared for me; proceed to the hall of the incarnation; proceed to the pure chamber of my generation after the flesh. Speak in the ears of my rational ark, so as to prepare for me the accesses of hearing. But neither disturb nor vex the soul of the virgin. Manifest yourself in a manner befitting that sanctuary, and hail her first with the voice of gladness. And address Mary with the saturation, 'Hail, thou that art highly favoured, 'that I may show compassion for Eve in her depravation." The archangel heard these things, and considered them within himself, as was reasonable, and said: "Strange is this matter; passing comprehension is this thing that is spoken. He who is the object of dread to the cherubim, He who cannot be looked upon by the seraphim, He who is incomprehensible to all the heavenly powers, does He give the assurance of His connection with a maiden? Does He announce His own personal coming? Yea more, does He hold out an access by hearing? And is He who condemned Eve, urgent to put such honour upon her daughter? For He says: 'So as to prepare for me the accesses of hearing.' But can the womb contain Him who cannot be contained in space? Truly this is a dread mystery." While the angel is indulging such reflections, the Lord says to Him: "Why are you troubled and perplexed, O Gabriel? Have you not already been sent by me to Zacharias the priest? Have you not conveyed to him the glad tidings of the nativity of John? Did you not inflict upon the incredulous priest the penalty of speechlessness? Did you not punish the aged man with dumbness? Did you not make your declaration, and I confirmed it? And has not the actual fact followed upon your announcement of good? Did not the barren woman conceive? Did not the womb obey the word? Did not the malady of sterility depart? Did not the inert disposition of nature take to flight? Is not she now one that shows fruitfulness, who before was never pregnant? Can anything be impossible with me, the Creator of all? Why, then, are you tossed with doubt?" What is the angel's answer to this? "O Lord," he says, "to remedy the defects of nature, to do away with the blast of evils, to recall the dead members to the power of life, to enjoin on nature the potency of generation, to remove barrenness in the case of members that have passed the common limit, to change the old and withered stalk into the appearance of verdant vigour, to set forth the fruitless soil suddenly as the producer of sheaves of grain,—to do all this is a work which, as it is ever the case, demands Your power. And Sarah is a witness thereto, and along with her also Rebecca, and again Anna, who all, though bound by the dread ill of barrenness, were afterwards gifted by You with deliverance from that malady. But that a virgin should bring forth, without knowledge of a man, is something that goes beyond all the laws of nature; and do You yet announce Your coming to the maiden? The bounds of heaven and earth do not contain You, and how shall the womb of a virgin contain You?" And the Lord says: "How did the tent of Abraham contain me? " And the angel says: "As there were there the deeps of hospitality, O Lord, You showed Yourself there to Abraham at the door of the tent, and passed quickly by it, as He who fills all things. But how can Mary sustain the fire of the divinity? Your throne blazes with the illumination of its splendour, and can the virgin receive You without being consumed? "Then the Lord says: "Yea surely, if the fire in the wilderness injured the bush, my coming will indeed also injure Mary; but if that fire which served as the adumbration of the advent of the fire of divinity from heaven fertilized the bush, and did not burn it, what will you say of the Truth that descends not in a flame of fire, but in the form of rain?" Thereupon the angel set himself to carry out the commission given him, and repaired to the Virgin, and addressed her with a loud voice, saying: "Hail, thou that are highly favoured! The Lord is with you. No longer shall the devil be against you; for where of old that adversary inflicted the wound, there now first of all does the Physician apply the salve of deliverance. Where death came forth, there has life now prepared its entrance. By a woman came the flood of our ills, and by a woman also our blessings have their spring. Hail, thou that are highly favoured! Be not ashamed, as if you were the cause of our condemnation. For you are made the mother of Him who is at once Judge and Redeemer. Hail, you stainless mother of the Bridegroom of a world bereft! Hail, thou that hast sunk in your womb the death (that came) of the mother (Eve)! Hail, thou animate temple of temple of God! Hail, thou equal home of heaven and earth alike! Hail, you amplest receptacle of the illimitable nature!" But as these things are so, through her has come for the sick the Physician; for them that sit in darkness, the Sun of righteousness; for all that are tossed and tempest-beaten, the Anchor and the Port undisturbed by storm. For the servants in irreconcilable enmity has been born the Lord; and One has sojourned with us to be the bond of peace and the Redeemer of those led captive, and to be the peace for those involved in hostility. For He is our peace; and of that peace may it be granted that all we may receive the enjoyment, by the grace and kindness of our Lord Jesus Christ; to whom be the glory, honour, and power, now and ever, and unto all the ages of the ages. Amen.